A PNNL researcher tests vanadium redox flow battery technology that was licensed in 2012 by UniEnergy Technologies. The Mukilteo, Wash. company's batteries will be installed as part of two energy storage projects announced July 8, 2014, by Washington state Gov. Jay Inslee. RICHLAND, Wash. — Three Washington state utilities have been awarded $14.3 million in matching grants from the state's new Clean Energy Fund to lead energy storage projects with ties to federally funded research at the Department of Energy's Pacific Northwest National Laboratory. Gov. Jay Inslee and the state Department of Commerce announced the grants today at the Mukilteo, Wash., facility of UniEnergy Technologies, which is also known as UET and has licensed PNNL battery technology. Two of the winning utilities will install UET's all-vanadium redox flow batteries as part of their projects. 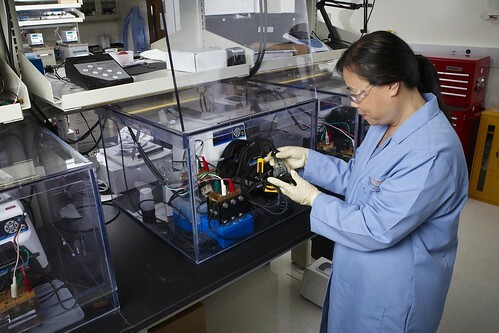 PNNL developed the battery technology with six years of funding from DOE's Office of Electricity Delivery and Energy Reliability. "We're using our Clean Energy Fund to position Washington state as a leader in energy storage and work with utilities to develop technologies and strategies that will move the market for renewables forward," said Gov. Inslee. "Delivering operational value for our utilities is crucial if we're going to successfully develop and deploy clean energy technologies that save energy and reduce energy costs, reduce carbon emissions, and increase our energy independence." "As a national lab, PNNL strives to help the entire nation access clean, reliable energy and strengthen the power grid's resilience," said PNNL Director Mike Kluse. "But it's with particular pride that we see our own research and development being implemented in such innovative projects right here in our home state." PNNL is also expected to provide analytical and technical support for the projects. PNNL will conduct benefits analysis, compile field data needed for use cases that help utilities and regulators understand the long-term benefits of new technologies, design plans for acceptance testing and strengthen control strategies. In addition, PNNL plans to collaborate with Washington State University to develop a battery control system for one project and intends to work with the University of Washington's Clean Energy Institute to share benefits experienced during the projects. Results from these Washington state-based demonstrations are expected to contribute to national energy storage efforts. Today's announcement builds on federal investments in Pacific Northwest grid modernization initiatives, including the Pacific Northwest Smart Grid Demonstration Project, the nation's largest regional smart grid demonstration project, and Smart Grid Investment Grant funding. "The Energy Department's smart grid technology investments and deployment efforts are helping to build a more resilient electric grid that helps communities adapt to increased severe weather events and to enable the integration of distributed and renewable energy resources that mitigate environmental emissions," said Patricia Hoffman, assistant secretary for DOE's Office of Electricity Delivery and Energy Reliability. "Today's announcement is another important step in enabling industry and our National Laboratories to continue working together to improve the resiliency, efficiency, and security of the nation's grid." Avista Utilities of Spokane, Wash., was awarded $3.2 million. Its project includes installing a UET flow battery in Pullman, Wash., to support WSU's smart campus operations. PNNL will collaborate with WSU to develop a control strategy for this project. Avista is participating in the Pacific Northwest Smart Grid Demonstration Project and previously received a DOE Smart Grid Investment Grant. Puget Sound Energy of Bellevue, Wash., was awarded $3.8 million. Its project includes installing a lithium-ion battery. As part of a previous project that was jointly funded by the Bonneville Power Administration, Primus Power, Puget Sound Energy and DOE, PNNL analyzed the costs and benefits associated with installing energy storage at various sites within PSE's service territory. Snohomish County Public Utility District No. 1 of Everett, Wash., was awarded $7.3 million. Its project includes installing a UET flow battery and a lithium-ion battery. This project builds on experience gained and equipment and technologies installed with a DOE Smart Grid Investment Grant. Gov. Jay Inslee, DOE Assistant Secretary Patricia Hoffman and Jud Virden, who leads PNNL's Energy & Environment Directorate, were among the officials who spoke at today's event. For more information about the state-funded projects, click here.